In general, Border Collies are medium-sized dogs with a moderate amount of coat, which is often thick and frequently sheds. Their double coats vary from smooth to rough, and come in many colours, although black and white is the most common. Black tricolour (black/tan/white or sable and white), red, white, and red tricolour (red/tan/white) have also been seen regularly, with other colours such as blue, lilac, red merle, blue merle, brindle, and "Australian red/gold" seen less frequently. 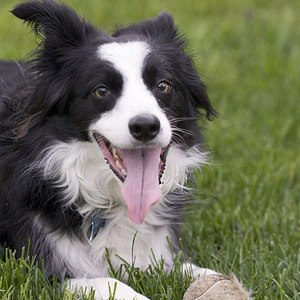 Some Border Collies may also have single-colour coats. Border Collies persistent herding technique and desire to work makes them an outstanding goose chaser. The dogs love to swim and are a great asset in quickly clearing the geese from any private land.